Canadian Junior Hockey League, Central Canadian Jr. "A" Championship. The Dudley Hewitt Cup Game 4 between Georgetown Raiders and Trenton Golden Hawks. TRENTON, ON - MAY 3, 2017: Canadian Junior Hockey League, Central Canadian Jr. "A" Championship. The Dudley Hewitt Cup Game 4 between Georgetown Raiders and Trenton Golden Hawks. 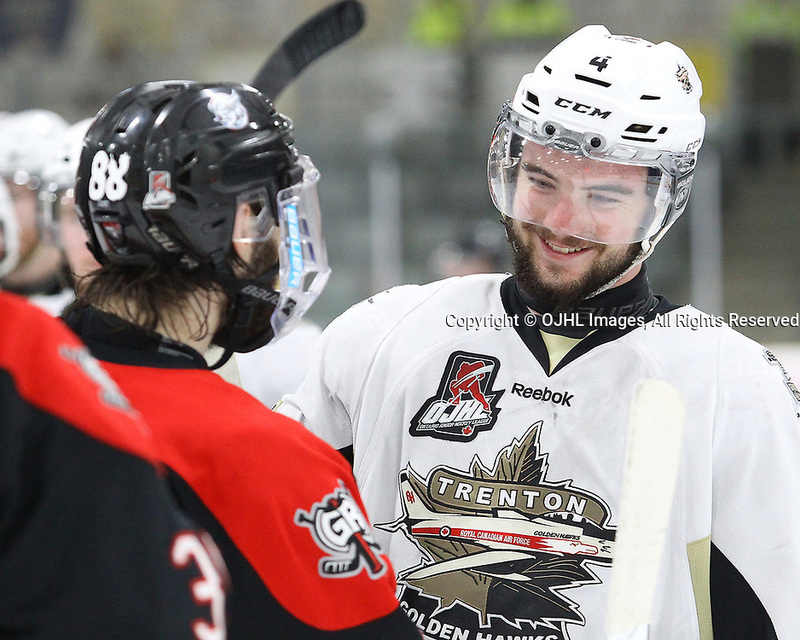 Chays Ruddy #4 of the Trenton Golden Hawks shakes hands with Andrew Court #88 of the Georgetown Raiders post game.